For example, in 2012 L'Oréal Paris used search to reach a broad audience looking for information about the popular “ombre” hairstyle. This hair treatment was only done in salons at the time, but L'Oréal Paris saw the trend’s potential and developed a home market product in just a few months. In addition to the home product, L’Oreal Paris created YouTube content devoted to the topic, got widespread press coverage, and owned the search for the term—all of which established brand awareness. In the end, the very people who had alerted L'Oréal Paris to the trend were shown search ads that linked to helpful marketing, right at the moment of interest. Think with Google took a look at how brand marketers are understanding, reaching and influencing audiences using search, and how they’re measuring the impact. Check out the full collection for more details on the research, case studies and a guide for marketers on how to use search for brand marketing. Search ads typically aren’t part of the brand marketer’s toolkit, but thanks to a few leading advertisers, they may be soon. 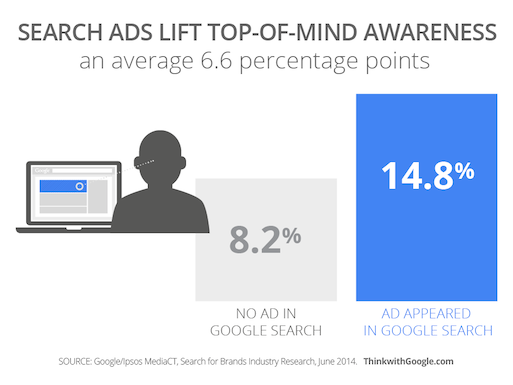 A recent Google/Ipsos MediaCT meta-study showed that search ads drove an average increase of 6.6 percentage points in top-of-mind awareness, from 8.2% to 14.8%—a lift of 80%. Marketers are starting to turn to search advertising as a way to learn more about their brands and connect with consumers.